The gloriously simple peanut butter and jelly sandwich is magic. It tastes great, it's easy to make, and it changed the country. Though it's deceptively easy to make -- hard to screw up a three-ingredient sandwich -- people have very strong opinions about how it is supposed to be constructed. Yes, it can absolutely be made in a variety of ways despite the dearth of ingredients. How do you know people feel strongly about the topic? 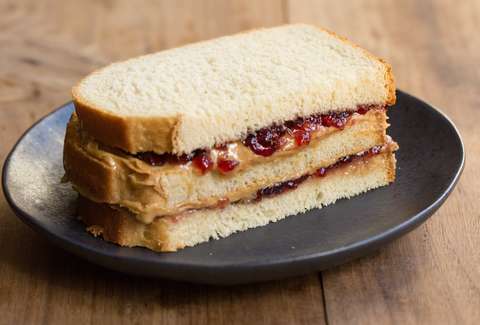 One tweet triggered a long debate about the proper way to build the perfect PB&J. Twitter user Lexie Ebensberger posed a question about how to build your PB&J. Should it go bread, peanut butter, jelly on top of peanut butter, and then the second slice of bread? Or should you construct it by spreading peanut butter on one slice and jelly on the other, then bringing the slices together? There are strong feelings on both sides of the argument. However, the loudest voices seemed to object that there weren't more options available because it turns out there are a lot of ways to make a PB&J. The best way to avoid the sog is bread peanut butter a buffer piece of bread then jelly then bread. The best way to make it. But does anyone put butter on theirs?? 😋 toast the bread. Add the butter. Put PB on both slices and jelly on both. Of course, one rabble-rouser had to make everyone a little nervous about just how weird people can get. Ok, so this is what anxiety feels like.